This article will explains you how to perform various settings of sharepoint virtual pc image to take most advantage of it. 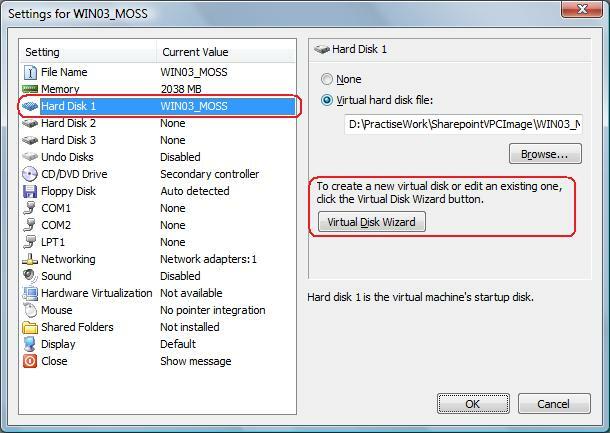 I would going to describe how to setup memory for VPC Image, how to run internet inside VPC Image and more settings of sharepoint virtual image. If you haven't Configure Settings of Sharepoint Virtual PC Image, than try following basics in order to make your life easy while working with sharepoint VPC Image. 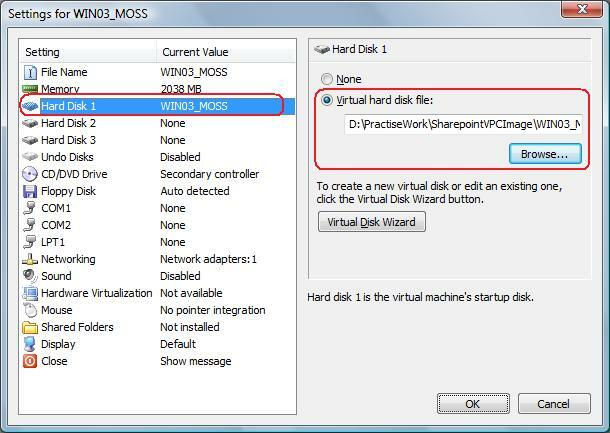 Step 1: Open Virtual PC Console, and Click on settings, in order to configure settings of sharepoint vpc image. Ones you click on settings Settings window will open. Click Memory from left pannel of settings window. As displayed in figure Memory settings appear on right side pannel of settings window. You can scroll the bar, in order to set memory. 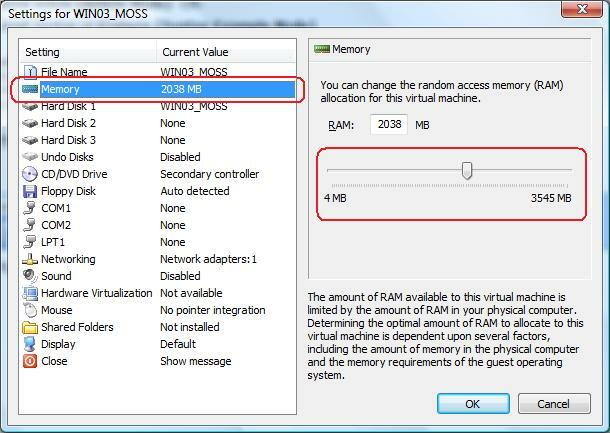 You can also allocate memory directly by typing number of Ram MB you want to allocate. In following example, you can see that there is approximatly 3.5 GB Ram, and out of it 2 GB of Ram is allocated for Sharepoint Virtual Image. Click Hard Disk 1 from left pannel of settings window. As displayed in figure Hard Disk 1 settings appear on right side pannel of settings window. In following example, you can see that location of Virtual Image file. If you move your virtual image file location than you should change this location and point to location of virtual image file. If you want to Create New Virtual Sharepoint Image than you should follow instruction in following article. 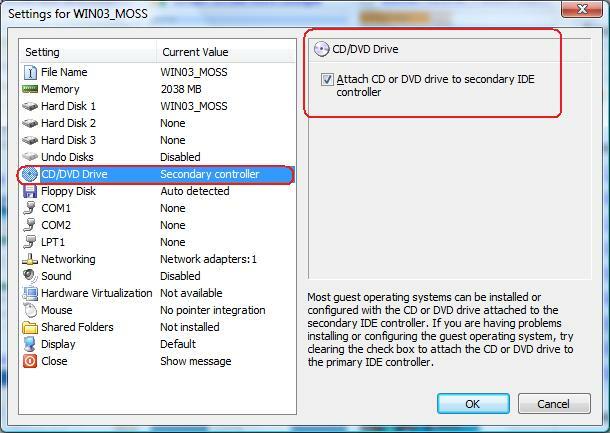 Click CD/DVD Drive from left pannel of settings window. As displayed in figure CD/DVD Drive settings appear on right side pannel of settings window. In order to use CD/DVD Drive from Sharepoint VPC Image, make sure that checkbox is checked as displayed in following image.irtual Image. Click Floppy Disk from left pannel of settings window. 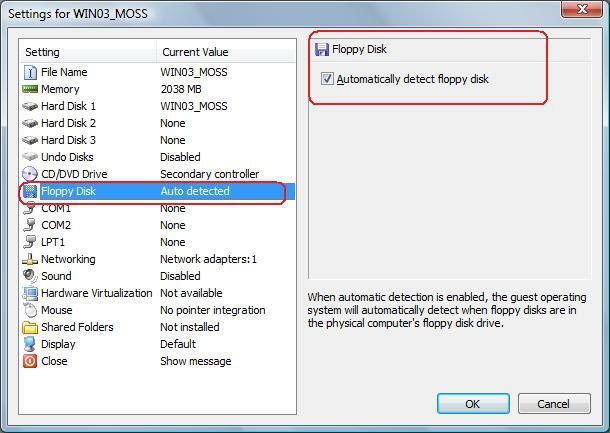 As displayed in figure Floppy Disk settings appear on right side pannel of settings window. In order to use Floppy Disk from Sharepoint VPC Image, make sure that checkbox is checked as displayed in following image.irtual Image. Click Network from left pannel of settings window. 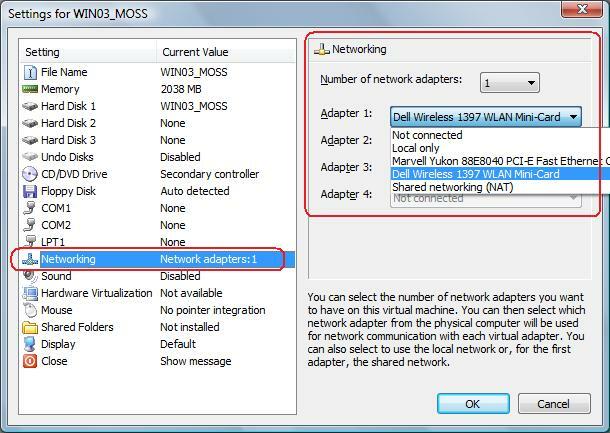 As displayed in figure Network settings appear on right side pannel of settings window. 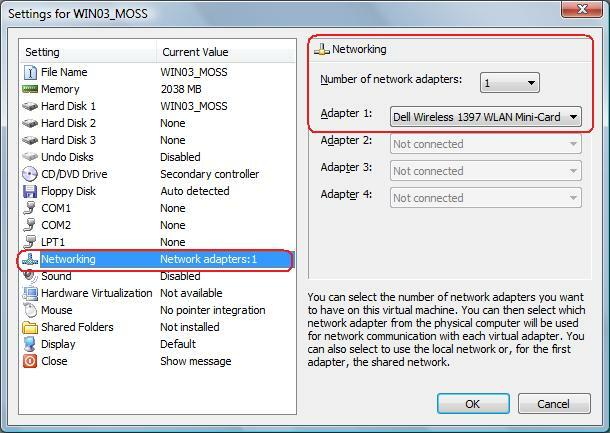 As displayed in figure, there is only 1 network adapter i.e. Internet. You can select Internet driver from Adapter 1, similarly if you have more Networks available, you can select by choosing one by one from adapter. Note: After you set Network restart your Sharepoint VPC Image. 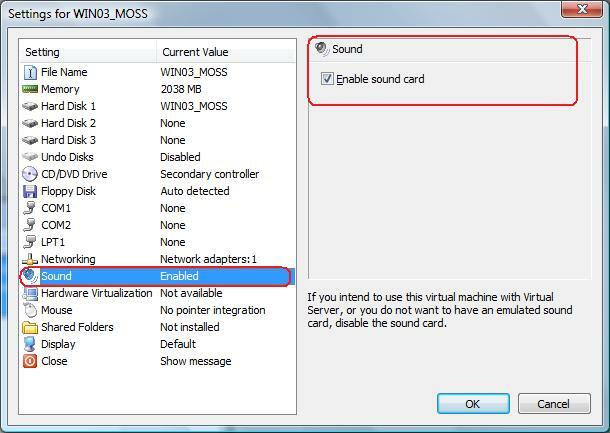 Click Sound from left pannel of settings window. As displayed in figure Sound settings appear on right side pannel of settings window. In order to listen Sound from Sharepoint VPC Image, make sure that checkbox is checked as displayed in following image.irtual Image. 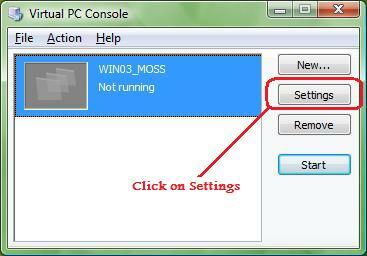 Click Mouse from left pannel of settings window. As displayed in figure Mouse settings appear on right side pannel of settings window. 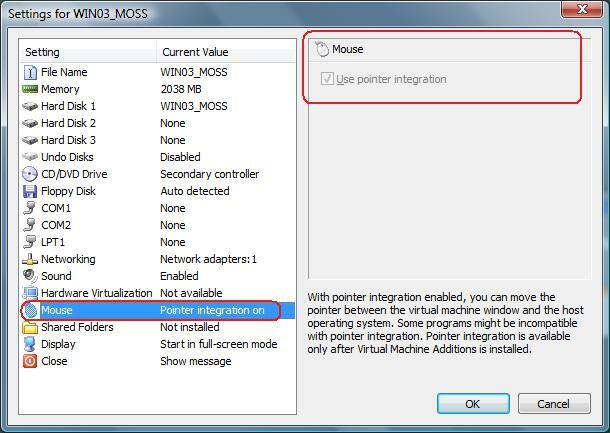 In order to move Mouse Pointer between the virtual machine window and the host operating system, check the "Use Pointer Integration" check box. Click Shared Folders from left pannel of settings window. As displayed in figure Shared Folders settings appear on right side pannel of settings window. 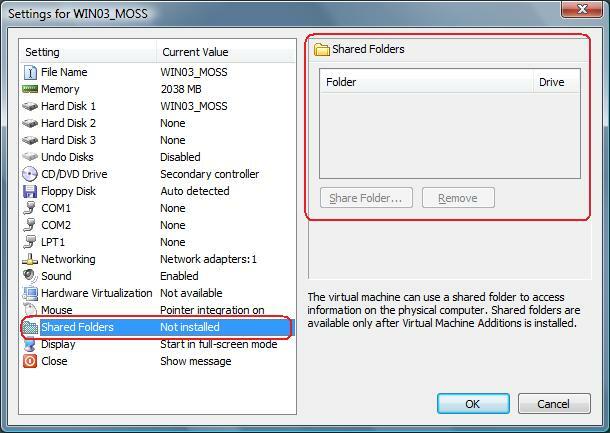 In order to use Shared Folders from Sharepoint VPC Image to access information on the physical computer you should select shared folder by selecting shared folder button. Click Display from left pannel of settings window. As displayed in figure Display settings appear on right side pannel of settings window. 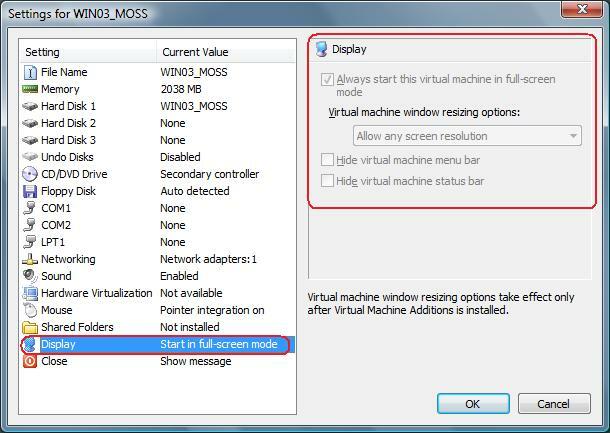 In order to run sharepoint vpc image in full screen mode you should check "Always start this virtual machine in full-screen mode" check box. Similarly you can try different display settings to suit your needs. Click Close from left pannel of settings window. As displayed in figure Close settings appear on right side pannel of settings window. 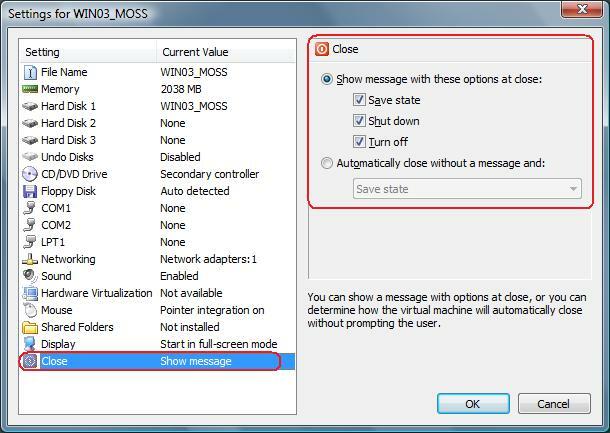 You can choose various message settings to be displayed or skipped while sharepoint vpc image is close. Didn't find what you were looking for? Find more on Configuring Settings of Sharepoint Virtual PC Image Or get search suggestion and latest updates.